I began my career in content marketing with the creation of Studio One nearly 15 years ago, well before the category had its own moniker. Since then it’s exploded, and even I’ve had trouble keeping track of the new technologies, business models, companies and tools that have sprouted up. This is a complicated and highly populated landscape. That’s why, last year, we developed the Content Marketing Landscape with the help of Terry Kawaja, founder and CEO of LUMA. Our goal was to help untangle the confusion created by dozens of new content marketing companies, platforms, and tools. Of course, innovations move quickly in this space. What was a comprehensive reflection of the industry last year is now incomplete. Companies have come and gone. New technologies and tools have emerged. Social media keeps growing as a content-delivery platform. To encompass this growth spurt, we’ve updated the Content Marketing Landscape for 2013. And this year, we’re taking it one step further with a series of articles illuminating various sectors of the ecosystem. But first, I’m proud to introduce the new Content Marketing Landscape (see above). 1. Marketers have more ways to reach consumers. The proliferation of technology has shifted content marketing from online-only to anywhere and any time. Marketers have never had so many platforms or technologies with which to reach consumers. Fortunately, the industry has responded accordingly. We’ve seen a huge increase in the number of technologies, tools and platforms to help content marketers deliver content across devices. I expect this space to continue to grow significantly in the coming years. 2. The idea of “content marketing” has expanded. Content publishers -- which include both traditional publishers as well as brands themselves -- have discovered new ways to reach customers. While many brands may have begun their content marketing efforts with an updated blog or video feed, today, the sky's the limit. Content marketers are using Vines, ecards and even curated playlists to deliver content to users. Even the ideas behind content marketing have been extended to new business models. Take for example native advertising, which uses Web technologies to create new linkages between content and advertising. 3. The space has more offerings than ever. It’s a given, but it’s important: The number of companies in the content marketing world has grown significantly over the past year. In addition, the offerings from established companies have also increased. 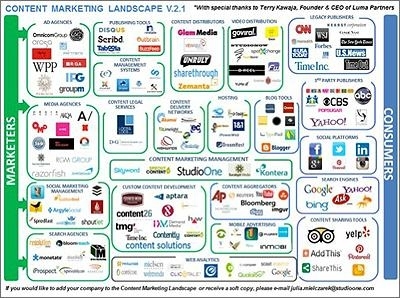 This updated content marketing landscape reflects the trend. Last year’s chart featured just over 90 companies, and this year’s version is nearly double that. We also decided to add a new category to the list to feature content management systems. It may seem like CMSs have been around nearly as long as those shiny kitchens. But since these tools are integral to many content marketing strategies, we felt it appropriate to give them a category of their own. I look forward to providing more in-depth coverage of the content marketing landscape. It’s an exciting space with plenty more innovations to come.